Kate Cusack is a Brooklyn-born artist who makes jewelry. Kate’s specialty is transforming ordinary materials into exciting pieces of art for the body. She has successfully created a multi-faceted career involving her unique Zipper Jewelry, whimsical window display installations for stores like Nordstrom and Tiffany & Company, and the creation of sculptural costumes for theater and dance. Kateearned her BFA from the Maryland Institute College of Art and her MFA in costume design from the Yale School of Drama. Kate’s artistic experiences— from costume design to the creation of wearable art—culminate in the Zipper Jewelry. All of her work relates to the body, combining theatrical influences and her love for the transformation of unusual materials. Kate’s transformation of zippers into jewelry reminds the wearer of the power of imagination and the joy of discovering a view of something that would otherwise be overlooked. Kate’s Zipper Jewelry has been featured in numerous fashion and design magazines in America and internationally. 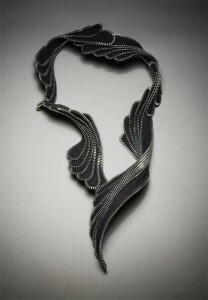 Her jewelry is exhibited in galleries and boutiques across America and is included in private collections.